A friend in Connecticut had a wonderful perennial border. I'd even go so far as to upgrade the name to "herbaceous border." Flowering began with daffodils and tulips amid the emerging foliage of peonies, Siberian iris, and daylilies which, in turn, added colorful flowers to the scene. As time went on the border aged. And so did my friend. Garden maintenance became more of a chore. Wisely, she chose to remove the majority of perennials and replaced them with shrubs. Still colorful, still interesting, and much less work. Sound good? I can see your head nodding, but you need more help than a stroll down the rows of a garden center. 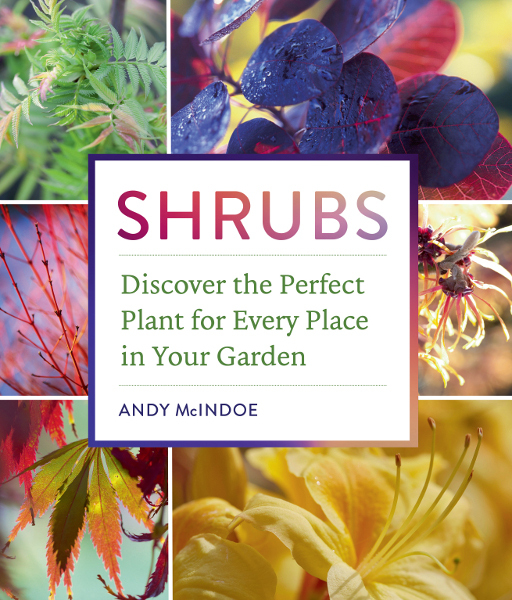 There are any number of books about shrubs for the garden. They tend to take an A-to-Z encyclopedic approach. Reading through the alphabetical presentation you read about something wonderful, only to discover it won't do for you. Your garden has a limiting factor - it might be shady, or has clay soil, or another issue. It then becomes a matter of looking for a suitable list in the appendices, flipping pages back and forth to cull out which shrubs might work for your situation. Andy McIndoe takes a different approach with Shrubs. 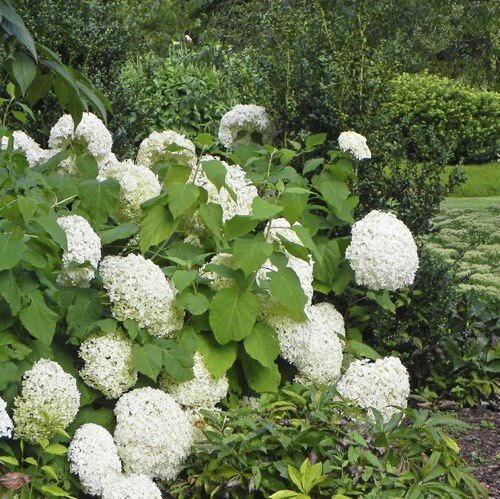 After first deciding what is a shrub (it has variations, depending on whether you are a botanist, a horticulturalist, garden designer, nursery professional, or gardener) he explains just what makes shrubs such a good choice. Another few pages on choosing for seasons of interest and desirable characteristics plus personal preference. 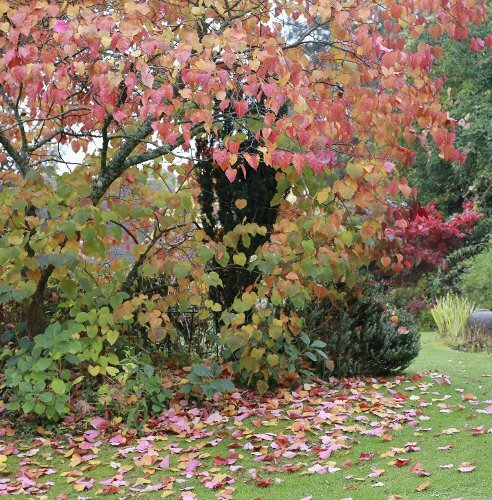 For the most part of the book there are separate sections that present the options for the different conditions with which every gardener must cope, beginning with shrubs for challenging conditions. These vary from shade to exposed and coastal conditions, wet and compacted soil including clay and new construction, alkaline and chalk or acid soils, hot and dry, to harsh winters. "But" you say, "how is that different from a list in the appendix?" It is simple. it receives kudos for its "flamboyant display." Easy care too, just prune hard in late winter. For each condition, an A-to-Z selection of shrubs receives an image and a description. Two shrubs to a page means a necessarily concise description and a quarter page image. Given the very diverse selection of shrubs it is impressive that all except 5 images are by the author. Most images are excellent, a few others are less useful. 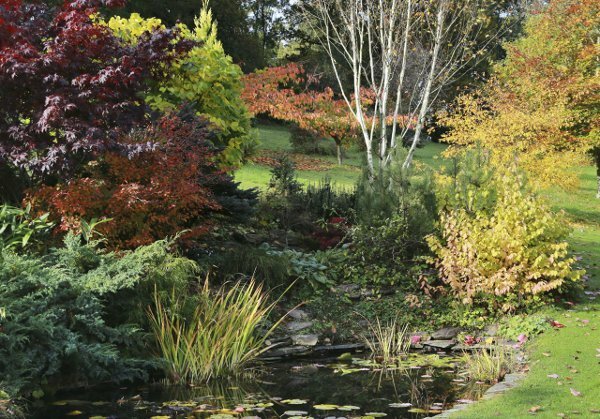 Andy McIndoe gardens in Hampshire, UK. The shrubs are presented with their Latin name, height and spread in metric with feet / inches in parentheses, UK hardiness zone and also USDA zones. who might not be familiar with both plants and benefit by seeing the duo. I wonder if Andy McIndoe may be at work on another book , one about perennials with an add-in of some few shrubs with which they might partner. an autumn landscape. What a lovely possibility. Or this landscape with several shrubs, a sweep of lawn, and a pond. It shows shrubs stabilizing the pond bank, another topic mentioned. Not everything here requires a sweeping landscape in a mild winter area. There are shrubs for harsh winters. Mention is made of shrubs suitable for containers, that might be brought indoors or into a greenhouse for the winter. Shrubs: Discover the Perfect Plant for Every Place in Your Garden has a useful format, grouping shrubs by specification rather than abelia through yucca. Look first at the section that most closely relates to your situation. Perhaps then page through shrubs to grow as trees, quick-growing shrubs, shrubs with fragrant flowers. There is a section about shrubs to attract wildlife, primarily bees, butterflies, birds, with one mentioned for small mammals. Followed by - what else, deer- and rabbit-resistant shrubs. 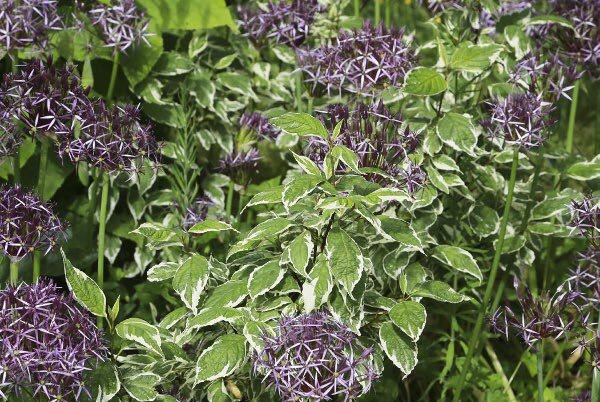 Most sections have suggestions for herbaceous planting companions. 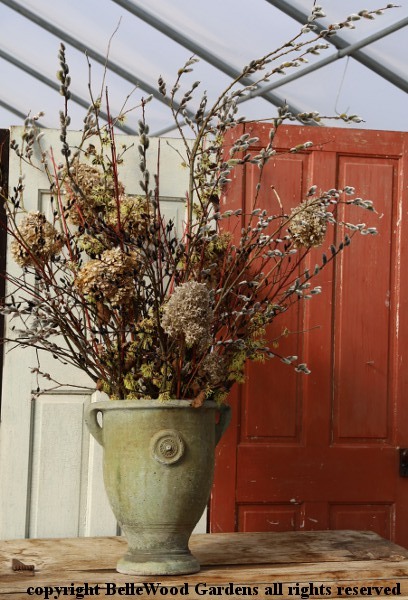 when you prune your shrubs there's more than roses to place in an arrangement.